Microsoft PowerPoint 2013 provides various options for the end use when opening a presentation file via the Open Dialog box. 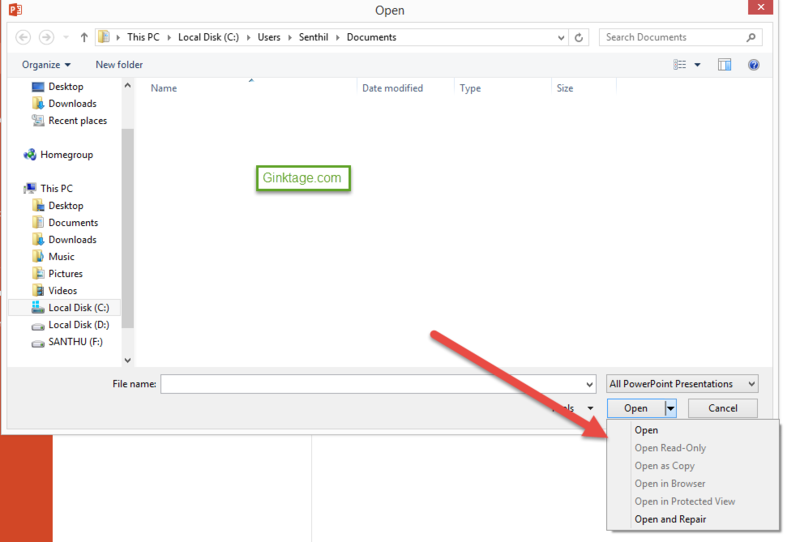 The Open option is the default one and provides the user the option to simply open the file. Open Read-only item in the dropdown list allows the user to open the file in the read-only format . The user can change the file via the Save As option. The Open as Copy options opens a copy of the file without touching the existing file from being modified. Open in Browser option is ideally valid only for the web presentations and lets the users to view the presentation in the web browser. The Open in Protected View opens the presentation file in the protected view which prevents the users from making any changes. The Open and Repair option lets the users open the file and identify as well as repair any errors in it automatically.